This ancient farmhouse with beamed ceilings, fire-places and terracotta floors has grown room by room over many generations of farming folk. It once housed some fifty people and their animals. The tower dates from as far back as Dante, when Guelf stalked Ghibelline in territorial wars along the nearby Tiber. Easily reached but secluded from asphalt roads, its rural character is intact in spite of microwave, central heating and Free Wi-Fi, There are nooks and books for quiet and solitude even during large family gatherings; a grand piano and a guitar for the musical. It is a little paradise for children who can cavort in three garden areas at different levels, these furnished with benches, outside tables, hammocks and a croquet set. We fell in love with the area, the beautiful countryside replete with history, art, exquisite towns and medieval villages. Weeks, even months, are not enough to get to know the treasures, the beauties of the region. Unlike Tuscany, beautiful as it is, Umbria is not packed with tourists in the summer months. It is an ideal place for family holidays, couple retreats, group gatherings or get togethers. Should you be interested you can get to know the locals and expats of the whole area in the little bar in Acqualoreto when they come together for a drink every Wednesday evening. The two large bedrooms share the largest bathroom but the main bedroom has its own sink. A third double bedded room off the study has its own bathroom. The two downstairs bedroom, one with a with single bed, the other with twin beds, share a bathroom with shower. The house is full of books, for adults and children, and toys: blocks, lego, etc. The larder has all basics in it: sugar, coffee, tea, flour, oil, etc. We loved our stay near Acqualoreto. The house is gorgeous, very well equipped and comfortable, the pool's waterfall was a hit with the children, the views from the house are wonderful, and Lin was very welcoming and attentive. It is also in a super location which made it very easy to go exploring the hillside towns. Highly recommended! Nothing can quite describe how charming Lin and Carlos's property is. It is a truly extraordinary home, full of beautiful furniture, artefacts and art inside and surrounded by well kept gardens with plenty of different shaded areas for outdoor entertaining outside. The pool is stunning with a lovely waterfall, which kept my children entertained for hours on end. It really feels like a home from home, and is brilliantly equipped with everything you could possibly need. Lin and Carlos are extraordinarily welcoming and helpful, and their knowledge of the local area was very much welcomed; especially as we were there for the Acquaroleto festival, where Lin introduced us to the beauty and charm of the village, and enrolled my children for the painting class that was taking place. We have the fondest memories of our week at the Tower House, notably for the peace and tranquility that surrounds it, and the generous hospitality of our hosts. Catherine and I rented the Tower House for the whole of May 2016, having stayed there a few years previously for a week as the guests of friends, who themselves were on their second visit. Having once experienced the delights of the house, garden and the warm and unfailingly helpful hospitality of the owners, Lin and Carlos, you inevitably want to return. We hosted and entertained a procession of friends and family during the month, all of whom were enchanted by the house which is spacious, comfortable and full of beautiful art and artefacts, reflecting the taste, travels and interesting lives that Lin and Carlos have led. The Tower House and its splendid secluded garden have wonderful views of the surrounding hills and countryside. It is also ideally situated to explore the fascinating historic hill towns that make Umbria such a delightful destination. I recommend it wholeheartedly. Vacationing at la Cupa, in its authentic and sophisticated simplicity works on several levels to restore wellness and fulfillment. Everything you could possibly need while in one of Umbria's most genuine microsettlements of medieval origins, is in the house and in the nearby hamlet of Acqualoreto (home to a very interesting mix of friendly locals and charming expats: the stunningly functional pool (perfect for an improvised session of acquagym or wetyoga immersed in mediterranean nature! ), the outdoor eating patios, the reading rooms, the grand piano, ect ect and last but not least, the central sandstone unique four-story tower which was used by some inspired guests as an outdoor climbing gym with an epic atmosphere. The listing description although accurate, barely captures the identity and feel of this place where we stayed with family and friends for a week in august. Extremely clean and well cared for, is a bit overwhelming at first due to the vast selection of the owners items which give the house a very distinct identity. And yet these items are also what made our stay very inspiring in every glance of the interiors and sorroundings. Lin and Carlos and their vast extended family are just great hosts and always provided solutions to the minor and largely forseeable domestic issues which arose. I would reccommend this property without any hesitation to all those looking to be inspired and fulfilled with La Cupa's sophisticated simplicity. Last summer my family and had the most amazing experience staying at Torre La Cupa! The pictures cannot possibly describe how beautiful this property is. The profusion of flowers, plants and trees and the tranquil buzzing of bees create a sense of separation from the rest of the world. The home is magnificent, and transports one back to medieval times, but with modern amenities! 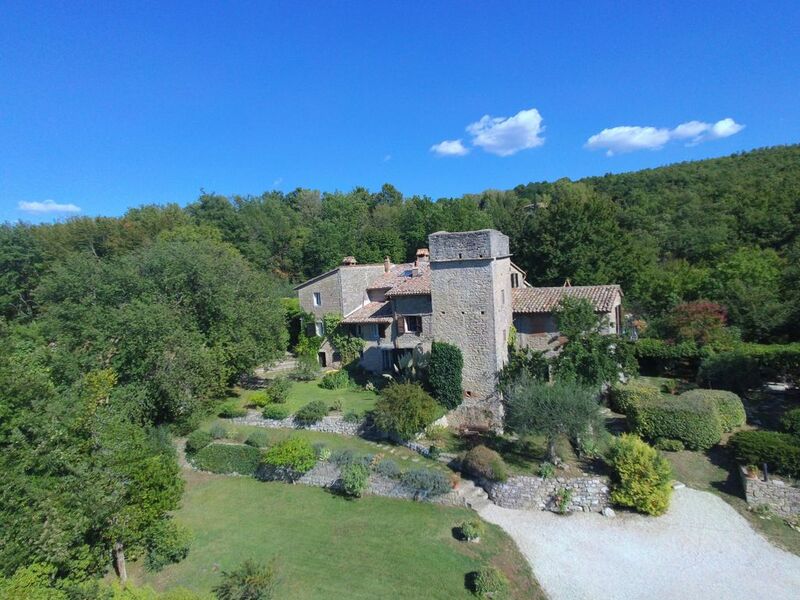 The comfort and seclusion made us long to simply stay put and enjoy, but the relative ease with which we traveled throughout Umbria and beyond, enhanced the magic of this place for our family. The owners were beyond kind and gracious. They helped us organize prepared meals, exposed us to the amazing town of Acqualoreto via a centuries old path from the backyard, and treated us like family. We made memories and friendships! Rarely in life are expectations greatly exceeded, but such was the case for us at this incredible place! How very kind of you to have written this lovely review. Our greatest pleasure was the rich experience of meeting you all. Thank you so much for coming and I hope somehow, somewhere we shall meet again. the week we spent at the Tower House was the high point of an eighteen day trip to four locations in Italy with two grown "children," their spouses, and four "grands" ages 12 and 10. although every stop held its own appeal, this "home" offered everything: it was an easy drive to many enticing "must-sees," it was close to a major transportation hub (Orvieto) where one could easily and quickly pop off to further destinations, and it offered a wonderful variety of near-by restaurants with easily described epicurean delights. but its major attraction was the ability to enjoy simple family time in such a gorgeous and other-worldly environment. Lin was a delightful, fascinating and ever-helpful hostess who managed every query, concern and request with easy aplomb. One only wished one could enjoy her company after a stay. The home, the grounds, the furnishings, the books (oh, the books!!!) all presented constant delights. And of course, the big and little children enjoyed the pool and the ever-present potential for exploring the area. there is no down-side to my review. the only caution would be that one must have transportation, and be comfortable with driving along the somewhat less than superhighway - type roads common in the Umbrian terrain . But the challenges posed by "getting there" are more than made up for by the vast variety of ancient, modern, secular, religious, historical and simply gorgeous natural attractions in the area. would i recommend the Tower House? absolutely no question. my only regret is that i have not yet booked my next trip; but i guarantee, it's on my to - do list. And as to whether it was magic for everyone: i must not fail to relate that my twelve year old grandgirl has already announced that the Tower House will be her marriage location! Still relatively undiscovered, not yet plagued by dense summer crowds, Umbria owes nothing to Tuscany for rural and urban beauty: wealth and variety of history, art and architecture: or museums, theatres and music festivals. The hills and walking country of this “green heart of Italy”, are dotted with medieval hamlets. Acqualoreto is nearest. San Gemini borders the Roman ruins of Carsulae & Montecastello Vibio contains the smallest theatre in the world. Fifteen minutes away is lovely Todi, founded by the Etruscans with its museum, cathedrals, medieval piazza and glorious views. Twenty minutes in the opposite direction is Orvieto, with its Etruscan graves & museum, sumptuous Cathedral & Signorelli frescoes. Forty minutes away are Perugia, Spoleto or Assisi, a little further north you find Gubbio, Urbino, Bevagna and Montefalco. To the west, Bolsena, Montepulciano and Siena are within easy reach. Rome and Florence are about 90 minutes away by car, or less by fast train. Rentals go from Saturday to Saturday, with one week minimum stay. Prices include: electricity, bed linen, bath and swimming towels, cleaning, and change of bed linen on Saturdays for rentals of more than a single week. Generous discounts for small parties. Please inquire. Firewood and metered central heating at cost.